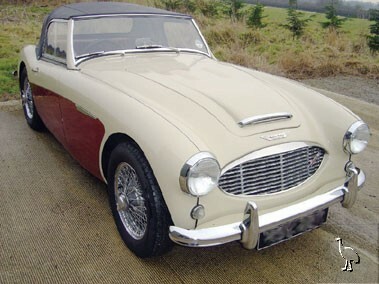 A significant step in terms of 'Big Healey' evolution and foundation block for one of the 1960s' most charismatic rally cars, the 3000 MKI was introduced in March 1959. Capable of nearly 120mph, it was powered by an enlarged 2912cc version of the BMC C-Series straight six engine that developed some 124bhp and 167lbft of torque. Although, equipped with a similar chassis design to its 100/6 forebear, the new model enjoyed notably better braking thanks to the adoption of Girling front discs. Fitted with wire wheels and adjustable front seats as standard, it was available in two-seater (BN7) or 2+2 (BT7) guises. Finished in Old English White over Burgundy with Burgundy leather / vinyl upholstery, this particular example is described by the vendor as being in "good" order with regard to its engine, four-speed manual plus overdrive gearbox, electrical equipment, interior trim, bodywork and paintwork. A comparatively early 3000 MKI, 'XSV 467' is thought to have led something of a charmed life in Southern California before being repatriated to these shores and converted to right-hand drive during 1990. Believed but not warranted to have covered circa 62,000 miles from new, the Healey has been fitted with a later type centre-change gearbox (a most sought after upgrade). While, we are also informed that "the car's panel fit is particularly good as is the condition of its underside which shows no signs of any damage".